Klift Metaalbewerking is a work placement company accredited by SBB (vocational education and training for the labour market) for CNC Machinists on different levels. Lead by a young, eager shop floor supervisor, people are trained in their vocation process every year. Most of the current employees came from our own training. Learning and developing does not end after the initial vocational training. 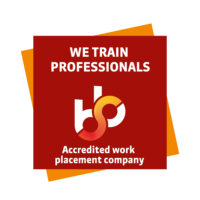 We feel strongly about the continuous education of the individual employee. Rapid technological developments demand it, however, personal development is important as well. As a team we regularly pay attention to subjects in the field of communication, health and safety, and teamwork. Education and development benefits our employees, the company, and of course the industry. The anticipated shortage of the right professionals in the machining industry is one of the reasons Klift Metaalbewerking participates in establishing the Expertise Center for Precision Technique (ECP) for the Rotterdam area and South Holland province. This center must provide pre-vocational secondary education students, lateral entrants and existing personnel with a training to machining professionals. Every year, we also offer trainees (on request) the opportunity to gain experience in our company. They will then learn how much fun it is to work in our industry, where metal technique and ICT go hand in hand due to the ever-increasing automation and robotization.